Since the holidays were around the corner, I decided to recreate this chocolate treat with red and green spoons (and later blue, too). Then I could give out a little homemade treat to friends and coworkers rather than breaking the bank with something bought. I bought the chocolate from Woodmans: one bar of white chocolate, and one plain chocolate bar. I had a few squares left in each package when I was done; so if you're making 60 spoons, two pounds should be more than enough chocolate. I also got some various sprinkles and candies from the same grocery store for decoration. My mom picked up the spoons for me at Party City; I believe there were 24 in each pack. I got three packs: red, green, and light blue; which totaled over 60 spoons! When I was at the thrift shop over Thanksgiving weekend I found a roll of about twelve different ribbon patterns for $0.90, so I bought it with this project in mind. To package them up as I did, you'll also need some plastic wrap and scissors. Wane helps melt the white chocolate in a "double boiler"
So I called brother Teej and asked him if I could add anything to make it more liquid-y. He said I might have burned the chocolate if the smaller pan had touched the boiling water below, or the metal sides of the bigger pot. It had been in contact with both of those things, so perhaps that's what happened. Unable to reverse what was done, we began scooping up the white chocolate and pressing it into the spoons with a knife, then scraping it flat. When it was time to melt the chocolate bar, my friend Wane asked, "Now tell me again, why we aren't just using the microwave?" Before I could even finish my answer, he had put a bowl of chocolate into the microwave and pressed the start button. It ended up working, and that's how we melted the rest of the chocolate! I'm still not sure if my makeshift "double boiler" failed us, or if it was the type of white chocolate that failed to melt as I'd wanted. 2. 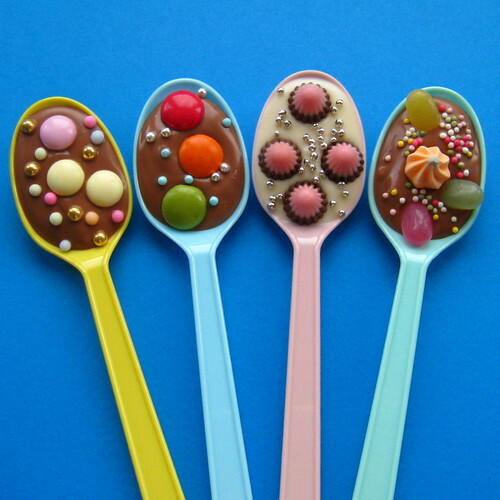 Spoon the melted chocolate into the plastic spoons. If you can get your chocolate to melt, spoon it into the plastic spoons. You don't want to put in too much since it'll run over the edges if the spoon gets tilted as you move it to your decorating station. 3. Prop up the spoon handles on a book/magazine so that the chocolate sets flat. I used a couple of magazines and books for the newest spoons, then would move them off once the chocolate had hardened again. 4. Wait a few minutes, then add sprinkles/decorations. When the chocolate's not super hot, yet when it's still malleable, sprinkle on some decorations! 5. When the chocolate in all of the spoons has hardened, begin cutting squares of plastic wrap. I was ripping off pieces of plastic wrap, then cutting them with scissors. My parents were both watching me package up the spoons when before I knew it, they were helping too! My dad grabbed a knife and cutting board to cut the plastic wrap into squares, as the scissors were proving difficult. 6. Wrap the chocolate part of the spoon in plastic wrap. I wrapped the spoons going from corner to corner of the plastic wrap diagonally, to have a greater surface area for covering. 7. Tie a ribbon around the plastic wrap at the base of the spoon. As papa was cutting the plastic wrap, mother began cutting pieces of ribbon for me to use. Sometimes I would tie just one color around the spoon, but on others I would use a solid color paired with a pattern. Yours will depend on how much ribbon you have at your disposal. 8. Use scissors to curl ribbon. If you've never curled ribbon before, this youtube video will show you how. If you already know how to curl ribbon, watching Miss Nancy teach people how is still worth a look! I find the children a bit... distracting, how about you? 9. Give the spoons away, eat them... or just put them on display! If you do use the ribbon like I did, these spoons make great decorations. I set some out on our piano at my parents' house, then packed the rest up into a box to take downtown. Afterwards I made a few tags for some, tying two or three spoons together with ribbon and a tag with the recipient's name. While making the sister's tag, I accidentally cut myself with the scissors. Using what was at my disposal, I quickly grabbed a napkin from the kitchen table and wrapped it around my bleeding finger, then tied it tight with ribbon! If I didn't see you this past week, or if you live out of the country - my apologies, but the spoons are all gone! However, just like trivia the other week, this was another sign that I'm making connections again here in Madison. I did give some people two or three spoons each, but that's still a lot of spoons gifted to friends! If anyone tries to make these, let me know how you end up melting your chocolate: double boiler, microwave, or is there some other way I should be aware of? If anyone has made another craft for a holiday gift, I'd love to see! Do you just put these in coffee? Or are they strong enough to put into hot milk alone? I made them just for eating - straight to the mouth! But I bet you could stir one into coffee or hot chocolate for a little kick. Thanks! Glad I saw your post that month!